DEZIGNLINE offers robust, rapidly-deployable, cost-effective infrastructure systems that improve safety and mobility for people who bike, walk, roll and scoot. 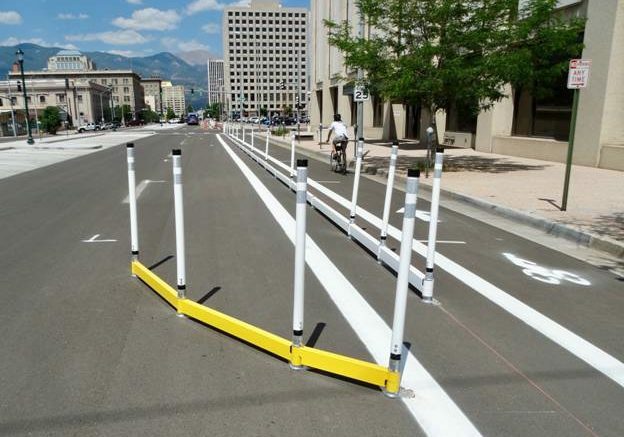 Minneapolis, MN – DEZIGNLINE™ is proud to offer cities a suite of innovative, quick-build steel infrastructure solutions that physically separate vehicular traffic from bike lanes and pedestrian zones. Appropriate for permanent or temporary installation, DEZIGNLINE products are ideal for new or retrofit applications as they do not impact planned or existing utilities. BIKERAIL™ and PEDRAIL™ are both modular steel rail systems that offer the substantial protection of a concrete curb, but are rapidly deployable and 100% changeable, movable and reusable. 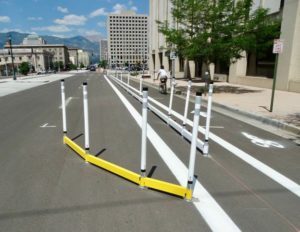 BIKERAIL creates a fully protected bike lane with rails that are 3” x 5” and available in 4’ and 8’ lengths. PEDRAIL creates safe pedestrian zones, including intersection bump-outs, center medians and refuge islands; rails are 2” x 4” and available in 2’ and 4’ lengths. STEELGREEN™ Planters are 4’ x 2’ multi-purpose structures designed for bike lane buffer zones: protective, green, portable, customizable. Their strong, durable basin is available in galvanized or powder coat color finish, and their forklift-ready base can be anchored to the street surface for added stability. Options include removable INFOPANELS™, a self-watering system, and a PEDISTILL® Hand+Foot Rest. Cities can easily combine STEELGREEN Planters with BIKERAIL or PEDRAIL sections to create highly protective and aesthetically pleasing corridors and pedestrian-friendly spaces. DEZIGNLINE is a firm with 35+ years of experience in developing products that enhance the public realm. Based in Minneapolis, DEZIGNLINE works with an extended team of Design, Marketing, Sales and Management professionals to deliver solutions for communities who are incorporating practical, efficient bicycle and pedestrian safety infrastructure into their Active Transportation and Mobility plans. Be the first to comment on "DEZIGNLINE™ Offers Rapidly Deployable Infrastructure that Creates Safer Streets"